Our next TV Tuesday will cover another slate of new shows, and another batch of favorites, including NBC comedies. We know everyone has different tastes when it comes to TV, but we hopefully cover enough to keep things interesting. And if not? Tell us what we should be watching! 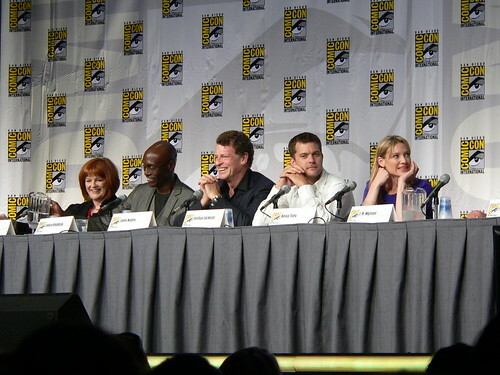 From the 2010 San Diego Comic-Con, audio from the “Fringe” panel featuring Anna Torv, Joshua Jackson, John Noble, Jasika Nicole, Lance Reddick and Blair Brown, as well as executive producers Jeff Pinkner and J. H. Wyman. Fringe returns to Comic-Con as Lance Reddick and Blair Brown make their first appearance at the convention, joining fellow series stars Anna Torv, Joshua Jackson, John Noble, and Jasika Nicole plus executive producers Jeff Pinkner and J. H. Wyman for a Q&A with fans and an exclusive video presentation. Join the discussion of this critically acclaimed thriller, which explores the ever-blurring line between science fiction and reality, where hybrid monsters tear through sewers, thieves walk through walls and portals open to worlds unknown. From Bad Robot Productions in association with Warner Bros. Television, Fringe airs Thursdays at 9pm ET/PT on FOX, and Fringe: The Complete Second Season will be released on Blu-ray and DVD on September.